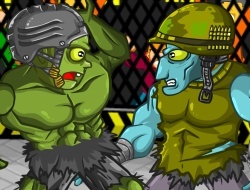 The fight is about to begin in this zombie fighting game and you will have to tame one of your own to be able to become the next champion. There are many types of zombies that you can get to fight for you but the most important thing is the equipment you put on them and the only way to get higher than standard one is to try your best to win all the fights so you will grab the big money. Have fun in this turn based combat system and you will surely be able to plan out your moves as you will be able to see the stats of your enemies before the fight starts. Zombie Fight Club 10.00 between 0 and 10 based on 3 votes.